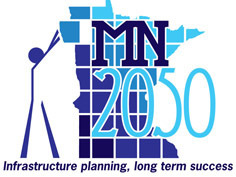 It’s been a while since we've last shared an update about MN2050. We've been busy with fundraising, internal meetings, sponsors, and our relationship with Twin Cities Public Television (TPT). And now it’s time to roll out the red carpet for the premier of the first of three video productions, "State of Repair: Roads and Bridges." Tap-into your calendar, phone or tablet on Sunday, September 14 at 7 p.m. on tpt’s Minnesota Channel (tpt MN over the air in the metro area at 2-2). Check local listing for cable and regional broadcast channels. If you miss ithe broadcast, the program will be streaming online at www.tpt.org, and on YouTube for you to watch and share with others. View a preview of the video below. It’s been a long road since early 2009 as our genesis came after America 2050 and we organized as MN2050. A similar effort by Blueprint MN resulted in the excellent water focused TPT production entitled, Liquid Assets, which premiered in December 2011. During the MN2050 five-year period, we convinced our sponsors that good infrastructure includes airports, bridges, ports, roads, and water (potable, wastewater, and storm). A huge thank-you goes out to the APWA-Minnesota Chapter and leadership for hanging in there and recognizing that all infrastructures are the foundation for a strong economy and quality of life. So what will you see and hear in September? “Do you like to eat? Everyone likes to eat, ” Larry Frevert, Past-President of APWA, says in the video. Minnesota is part of the "bread-basket" of our nation and sound infrastructure ensures a strong economy and continued top quality of life. Thus, the answer. MN2050 does not present the tools for investing in sound infrastructure, just the connections to a strong economy and expected positive outcomes. The video, "State of Repair: Airports, Ports, and Rail" will premier in late 2014. Early in 2015, we will debut, "State of Repair: Our Water Infrastructure," which is an update of the Liquid Assets video. Included with the third video will be a short vignette, "Where are we going from here?" MN2050 remains as energized as five years ago. But, it is time for our Generation Y members in APWA-MN, ASCE, AWWA, Central States, MN Rural Water, etc. to step up to the plate and take over. Our compelling message needs to be carried forward for another 35 years! Is this a long time? Not really when you think of Minnesota’s 157-year history as a state.